Bright Sunday mornings, and golfing with Paddy. Allyson tells me I’m no fun to shop for. She’s probably right, and it’s my own fault. 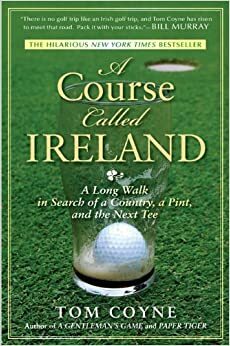 When it comes to my interests in life–golf and books–my tastes are so particular and my shopping trigger so quick that I’ve already either bought it, or don’t want it. If the golfer in your life is similarly difficult to buy for during this gifting season, I’ve compiled a list of things I would love this Christmas, if I didn’t already have them. So may you get more use out of this list than Allyson, and be a holiday hero to that golfer who has everything. The older I get, the harder it is for me to find things that live up to the hype. Going into this event, I knew that I would be in Ireland, I would be golfing, I would be with some friends and it was going to be incredible. But in every way, this trip surpassed my wildest dreams. Certainly the setting and experiences were beyond great. But it was the little things throughout the trip that made this an all timer. The thoughtfulness behind the gifts, the agenda, the fact that we had a professional photographer to capture it all, the little extras that we couldn’t have expected that made this something very special. I was fortunate this past year to visit both Streamsong in Florida and Cabot in Nova Scotia, and both are rare golf joy. Guests can binge on multiple courses at their doorstep and enjoy two genuinely pure golf experiences, playing 36 a day in two of my favorite golf settingsthis side of the pond. Friday-Sunday trips don’t get any better. There is a trend in golf gear and goodies toward smaller, specialty companies filling niches with high-quality, homemade product, and three I love are Seamus Golf and Jones Golf Bags out of Oregon, and Criquet Shirts out of Austin. You can feel good supporting these smaller shops, and you can feel cool gifting your golfer something from a company he or she should know about, but probably doesn’t. Artisan headcovers from Seamus, monogrammed carry bags from Jones, or throwback casual shirts from Criquet will make your golfer a trendsetter on the links. I think the little ball stampers from Stamp Your Balls are just the coolest, and always have one or two in my bag (Scottish Saltire is my fave). A Golficce. I was not near good enough to deserve one this Christmas, but Santa looked kindly upon my balance sheet. Cup and pin available from Doyle Golf, and hole in your foundation available from a reputable contractor near you. The Potty Putter is pretty self-explanatory. But of all the golf gifts I’ve given over the years, I’ve been thanked for this one more than any other. May the shopping spirits be with you, and may God bless us, every one.